Without further adue, let's start! Many stores are having friends and family events around this time of the year. Here are a few. Too Faced is having friends and family sale! Use code "FFSALE12" for 20% off everything. Recommendation: 3 way lash lining tool, better than false lashes mascara, chocolate soleil matte bronzer. Jurlique is also having friends & family event. Use "FFEVENT" for 25% off site wide. 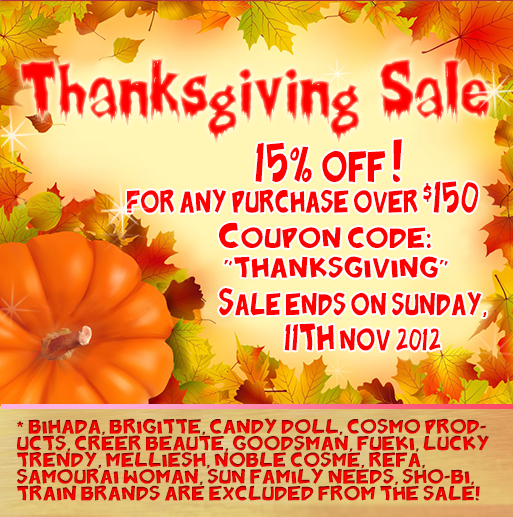 iMomoko is having a thanksgiving sale for any purchase over $150. 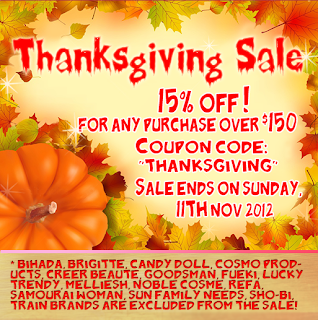 Use code "thanksgiving" at checkout. Sephora is having 20% off site wide! Use code "CELEBRATE". I know the recent super exclusive friends and family event has angered many loyal customers. I guess this is redemption? Nordstrom half yearly sale is back! This time is for women and kids. Savings up to 40% off. my-wardrobe is having 30% off selected items. Use code "AW12STYLE01"FOR $80 OFF $280 (for regular price items only). Recommendation: Christmas room (for holiday gift ideas), Vintage Heirloom section for Chanel classics. 30% off new arrivals at J.Crew Factory. Use code "HAULPASS" on orders over $100 for an EXTRA 20% off and FREE SHIPPING. Use Ebates on top of that for an extra 3% cash back. I have been obsessed with this website lately and probably have a lifetime of arm candy now. Still, I can't stop looking everyday. Recommendation: Best of october sale has a ton of bracelets that I absolutely love. Sales changes daily so you will never be bored.